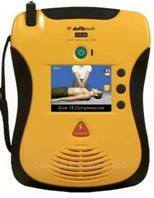 More FREE AED Training, at least to the extent read-only with pictures and no hands-on-the-AED provides AED training. This AED is a Defibtech Lifeline View. Can you see spot the On/Off button and shock button? Tips on EMS from Yuma, AZ Fires Dept. April 2013. It’s estimated that more than 95 percent of cardiac arrest victims die before reaching the hospital (from out-of-hospital cardiac arrest). A victim’s chances of survival are reduced by 7 to 10 percent with every minute that passes without CPR and defibrillation. Few attempts at resuscitation succeed after 10 minutes. 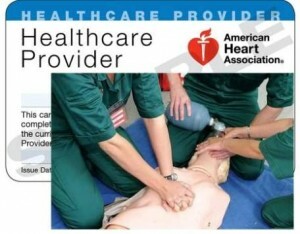 Right here – Free AED Training. The picture to the right is from a Heartstart OnSite AED unit. See the green Power button? (1) Turn it on. Can you see where the pads are located (hint: “Pull”)? 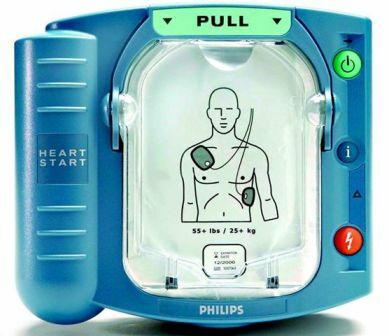 AEDs are Automated External Defibrillators – portable devices available for less than $2,000 that could save the life of an employee, customer, or visitor. Most people think heart attacks/cardiac arrests only happen to those over 60. Is Cardiac Arrest Only a Concern for Old People? Does Cardiac Arrest happen only to folks in their 60’s, 70’s, and 80’s? Can young, seemingly healthy young people, even under 20, die from sudden cardiac arrest? Are Cardiac Arrest victims all overweight, with clogged arteries and high blood pressure? Cardiac arrest strikes all ages, and even healthy young people with no prior health issues have died from cardiac arrest.